Week 25 The last batch of planks and templates for positioning the 2nd layer of planks. The bow planking has been finished, filled and rubbed down. Notice the corners of the ply marked by the arrows. This is where you are most likely to sand through the planking. 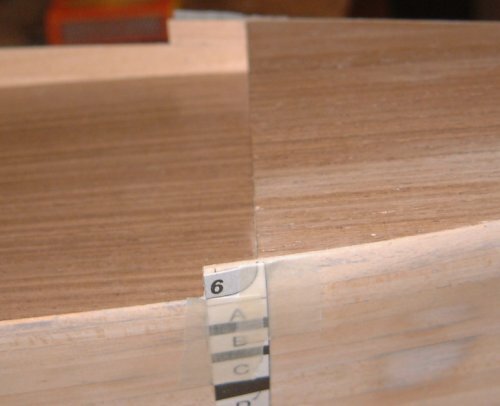 There is a bit of an angle where the ply meets the planking. You can make this disappear, but you will thin down both the ply and the planks. You will see how thin it's getting as you reveal layers of the ply. In the photo below you can see where I've gone through the first and second layers and just started to reveal the resin between the second & third layer. The resin is the dark reddish brown layer. This is as far as you can safely go without weakening the model to much. 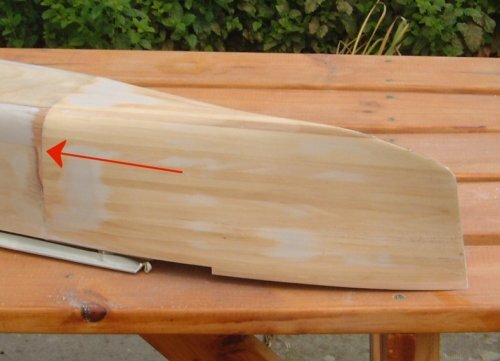 Any further and the hull will be very thin and easy to damage, and you run a very real risk of sanding right through. There's been a lot of sanding going on - but what should you use - there is a wide range of sandpapers available. You know that cheap brown stuff you can get ? Don't !!! It clogs up quickly, it's not very flexible, and just isn't good enough for model making. Buy a good quality Aluminium Oxide paper, which will probably be very light grey or yellow in colour. It's more expensive, but lasts longer and gives a better finish. I do most of the rubbing down with 120 grit, then finish off with 240 grit. Now that the hull is finished, it's time to apply the templates for the second layer of planking. But before we do that, I'm going to let you into a modelers secret on how to see if your hull is really finished. Wipe down the hull with a cloth dampened with brush cleaner to remove all the dust. Now you need to spray a light coat of primer paint over the hull. This will give you a nice grey hull, and all the small imperfections will stick out like a sore thumb. Now you can fix the faults, either by sanding, or filling and sanding. Finally, get the finest sandpaper that you can find, and rub the hull down again. You should end up taking all the paint off and leaving a perfect hull. If there are any spots where paint remains, there are holes or hollows and need to be filled. Before you spray the hull make sure that you mask the deck very thoroughly as you don't want any paint of the decks or bulkheads that have been put in place. Here you can see where I've sprayed the model and started rubbing down again. Notice the bits of grey where some of the planks are recessed slightly. The exercise also revealed a few missed nail holes and some areas where I hadn't sanded very well and were still quite rough. I used 240 grade wet and dry (used dry - the wood would absorb water and wreck the model if you use it wet). It's a messy process that takes a lot of time, and of course, is not necessary unless you are aiming for perfection. Don't try and get all the primer off. It is quite natural for the wood to absorb some of it and you will find that some of the grain of the wood has taken on a grey colour. The difference between absorbed paint, or paint the is just filling the grain, and an imperfection in the hull are quite obvious. However, I would emphasize that this is an advanced technique and you shouldn't attempt it unless you are confident about what you are doing. Good masking is essential. Fitting these templates is a bit tricky (and I thought is was going to be really easy !) I found that masking tape was the best thing to use. It's transparent enough so you can see the markings through it, and it's easily movable. I tried Sellotape, but the glue is too strong and it lifted some of the wood. Ho hum, out with the filler, yet again !!!! 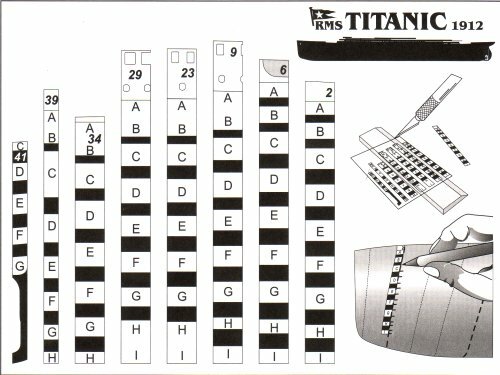 The positioning of these templates is not too critical in a forward/aft direction. A few millimeters either side won't matter too much. However, the height is critical, so spend a bit of time getting that right. It's also important to get them exactly vertical. Template 6 deserves a mention. This must be positioned exactly. Line it up with the end of the deck as you can see in the close-up above. You will probably find that it doesn't correspond with the measurements in the magazine. Don't worry about that, but just bear it in mind for the next few issues. Shock - horror - dissension in the ranks ! Somebody has disagreed with my choice of glue and filler. John King has sent in the following. I feel that body filler may be too hard to sand back to the timber, thus requiring a heavier paper. I've always used a "Wood Stop Putty" (Wattyl in Australia) that can be found in the paint section of hardware shops. It's in small tubes and available in several colours such as Teak, Rosewood etc. The beauty of this putty is that it is very easy to sand with the finest papers. I use grade 150 to get a smooth surface. The putty is also non shrinking and I've used it successfully with white glue. All I can say about white glue is that it's great for furniture where clamps of fasteners are used. I could not recommend it under any circumstances because the average modeler will get into all sorts of strife. Being a pressure glue, some poorly glued sections could also part company over time. The only glue to use in my humble opinion is a model makers glue available from all hobby shops with a model aircraft section. In a cool country like the UK one small bottle should do the whole ship. The glue needs to be refrigerated when not in use. Modeler's glue is actually a supa-glue but designed specifically for porous timber. It comes in free flowing and gap filling varieties. All you do is put the two parts in contact and place a drop of glue straight from the dispenser on a join. The capillary action of the glue will make it flow everywhere where the timbers touch. 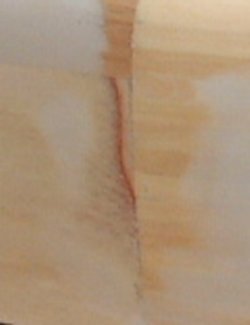 In the case of two parallel planks, a single drop of glue placed in the middle can travel for six inches or more along the joins. If the right amount is used, the glue will dry almost instantly. It lays perfectly flat and with a light sanding the model could be vanished. This glue is so strong it is used for RC model aircraft. 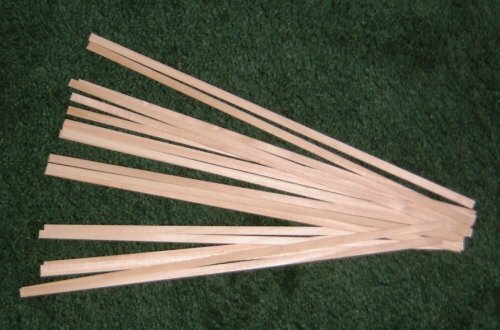 To avoid gluing one's hands together, planks are easily positioned with dressmakers pins. These are the ones that look like very thin map pins. They have very thin and sharp stainless steel shanks and a plastic ball on top. They are also longer than household pins and they often break before they bend. A packet of 50 will do the job. If the model is double planked, it's essential that the first layer is as smooth as a baby's bottom. The second layer is often very thin and needs a good base. The wood stop putty and modeler's glue will be perfect for this. Thanks John - it's always nice to have another point of view. You might also like to go back to week 16 where John wrote some other very good tips. I agree that white wood glue does need a good fit to get a strong join. However, I think pins or tape are perfectly adequate to provide the clamping that is required. If you have a badly fitting joint, it's no good filling it up with white glue - that doesn't work. Personally, I do not like super-glues very much for wood. They tend to set very hard and make sanding difficult. As an aside, I used to fly RC models, and I always used white glue for balsa and ply wood. Super-glue sets too hard and makes the joints brittle. 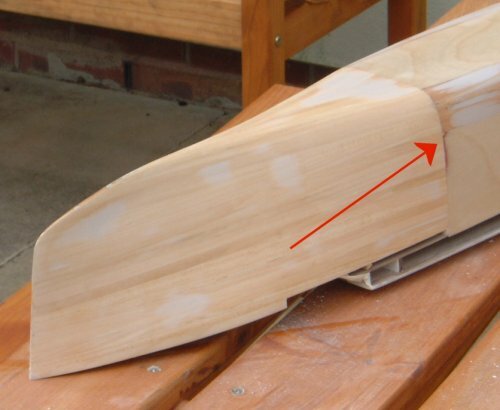 It's not a problem for normal flight, but if you are unfortunate enough to crash your model, the one made with white glue will flex a little and the flex in the joints and the wood will absorb a lot of energy and reduce the amount of damage. However, the one made with super-glue will shatter the joints as there is no flex in them. End of physics lesson. By the way, I never had a white glue joint fail without undue provocation.